Former Presidential candidate and Reform Party founder Ross Perot broke his self-imposed public retirement to make a bold warning: America could be taken over. Perot was the last man to make a serious independent run for President. That was back in 1992. He withdrew from the race after he and his family had received serious threats against their lives. By the time he had gathered himself enough to reenter the race, all of his momentum was lost and Republican hacks like Rush Limbaugh had a heyday making sport of him. But the things Perot tried to warn us about back then have all come to pass. The economic malaise that currently envelopes this country could have been averted had Presidents and Congresses from both major parties over the past two decades had the sagacity and courage to heed Ross Perot and Ron Paul’s warnings. In fact, looking back, Bill Clinton looks like a fiscal saint compared to fiscal sinners G.W. Bush and Barack Obama. Yahoo! News covers the story: “Former presidential contender and billionaire Ross Perot is worried that America is a sitting duck for an unnamed foreign invader. In an interview for his new autobiography, Perot said the nation’s weak economy has left us open for a hostile takeover–and neither presidential candidate is the man to save the country. 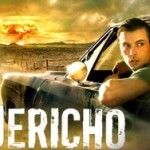 Fans of the CBS-terminated TV series JERICHO will recognize the name “Ravenwood.” This was the ruthless mercenary force used by the illegitimate federal government at Cheyenne to subjugate the citizens of Kansas in the aftermath of a massive nuclear attack against two dozen American cities. As with much of JERICHO’s superbly written story line, Ravenwood reflected real-world entities. Private mercenary forces have been used extensively throughout the Iraq and Afghanistan wars, as well as in many other theaters. And as JERICHO correctly depicted, these “private contractors” have largely operated without oversight or accountability. (Can anyone say, “Blackwater”?) For the most part, the American people are unfamiliar with these mercenary forces, because they normally operate in foreign theaters of war. JERICHO put them on the streets of U.S. cities. Now it looks like JERICHO was more prophecy than fiction. An underreported (what’s new?) story out of a little town in Montana has brought real-life drama to the CBS blockbuster TV series. Interestingly enough, CBS is the only major news network that has covered the Montana story. In the little town of Hardin, Montana (which is about the same size as the fictitious town of Jericho, Kansas, in the TV series), a private security firm, American Police Force (APF), has been contracted to provide all police services and to manage the operation of the town’s jail. According to local news reports out of Billings, Montana, “American Police Force officials showed up in Mercedes SUV’s that had ‘Hardin Police’ stenciled on the vehicles. The twist, the city of Hardin doesn’t have a police department.